12:00 am – We finally arrive at the Tenaya Lodge at midnight. The drive from Fresno wasn’t all that bad, the last 12 miles or so were pretty curvy, they also appeared to be the most picturesque, although it was hard to tell, being that it was pitch black outside the circumference of my headlamps. I am immediately impressed with the Tenaya Lodge as soon as we pull up. There is a large wooden canopy that covers the driveway when you first arrive, as well as a nice covered walkway leading to the front doors of the lodge. As I enter the lodge itself, I am taken aback for a moment by the magnificent stone fireplace and the stately lobby area. 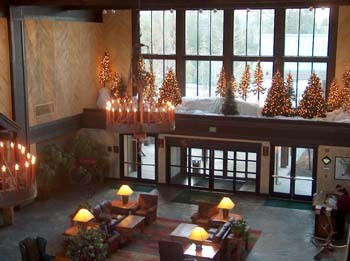 There is a large space above the entrance where the Tenaya Lodge decorators have planted a beautiful forest of artificial pine trees and evergreens and decorated them with thousands of tiny white lights. On the opposite side of the room stands a huge river rock fireplace where a vibrant flame dances a native dance on a stage of glowing embers. The entire scene immediately makes me feel at home. The lady at the front desk is very pleasant as she passes out our room keys and welcomes us each to the lodge. She offered to have my car valet parked, but I told her that I didn’t mind parking it myself. It is the slow season here at Yosemite, and the parking lot at the Tenaya is not very full, so parking is a pretty easy task. My second-floor room is a spacious King Suite with a view looking down over the back parking lot and the forest canopy that conceals the Summerdale activity area. The large king bed in my room is the zenith of lodging comfort boasting a thick down mattress cover that makes me think I am falling asleep on a cloud. The pillows are equally as comforting and it takes mere seconds for me to drift off to sleep. 7:45 am - It was difficult to pull myself from the down-filled comfort of my bed this morning, especially at such an early hour, but we have a big day ahead of us. First, we are off to meet Tom McCann, general manager of the Tenaya Lodge for breakfast in the Sierra restaurant here at Tenaya, after which we are going to tour Tenaya Lodge, then we are heading into Yosemite to visit the Wawona Hotel and Yosemite Lodge at the Falls. 11:00 am – Breakfast was excellent this morning. The Sierra Restaurant is spacious and bright. The outside wall of the restaurant is made up of mostly windows which look out onto the front lawn and poolside area. There is a large fireplace located in the center of the restaurant, but it was not burning this morning. I had a hard time deciding what to order for breakfast, not because there were no good options, rather the opposite, everything looked so tasty, it was difficult to narrow my choice down to just one entrée. I finally decided on the breakfast wrap which I feel was a wise decision because it was very good. Our tour of the Tenaya was very interesting. This is a very nice hotel with all the luxuries, amenities and conveniences that you would expect from a four-star resort. One of our first stops along the tour was to the Ball Room. The Ball Room is enormous, with a large stage along one wall, and magnificent picture windows which make up three-quarters of the wall along the east side of the room. The Ball Room looks out over the ice-skating rink behind the lodge, a new addition to the Tenaya this year. Besides the ice rink there is a large fire pit and outdoor sitting area. The Ball Room was still full of decorations from what must have been a great New Years Eve party a few days ago, I’m sorry I missed it. There are several other smaller meeting rooms along the same corridor of the lodge, each offering a wall of windows with views of the surrounding mountains and forests, and some even offering access to an outdoor patio area which I imagine would be beautiful in the summertime. The rooms at the Tenaya are all top quality accommodations. Each of the beds appears to offer the same cloud-like comfort of the one that I slept in last night. 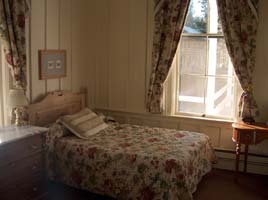 Many of the rooms which we are shown offer good sized bathrooms with shower and tub, a solid wood Armoire’s with cable television, cozy sitting areas with a comfortable mix of recliners and/or love seats surrounding a coffee table, and other essential amenities such as high-speed wireless Internet access, coffee makers, iron and ironing board and in-room safe. The indoor pool area is bright, clean and looks very refreshing if I had more time I’d go for a swim. There is a wall of windows along one side of the large room which almost makes you feel like your swimming outside except for the warm temperate climate. In one corner of the room, there is a relaxing hot tub which is calling my name and begging me to slip away from the walking tour and soak in the thermal waters for a while. Unfortunately, I know I don’t have time. In the other corner of the room is situated a wooden deck-like structure where a massage chair sits waiting patiently to accommodate guests with a poolside massage by one of the Tenaya’s message specialists, and across the room on the other side is a well-equipped gymnasium and spa area where one can enjoy relaxing massage therapy as well as a menu of spa treatments ranging from facials to body brush and polish, hydrotherapy, paraffin treatments and more. One of our last stops takes us downstairs to the arcade and game room, where there is a wide array of arcade games, everything from car racing games to street fighting games to pinball and everything in between. There is also a couple of pool tables positioned in the middle of the floor, and an air hockey table at the side of the room. If your teenager should ever get tired of all the outdoor activities that are available here at the Tenaya Lodge, he/she has no excuse for being bored as there is a whole other world of excitement waiting indoors and outdoors. 1:30 pm – The next stop on our journey” is the Wawona Hotel, one of Yosemite’s most historic lodges. I have seen many photos of this hotel over the past several years, but now that I stand on the hotel grounds I can say without hesitation that none of them do the Wawona a bit of justice. The Wawona Hotel reminds me of something from “Gone With The Wind.” A historic old Victorian style hotel that looks like it would be every bit as comfortable resting on a plantation in Georgia as it is here amongst the towering pine trees of Yosemite National Park. Every building at the Wawona boasts a large veranda that stretches around the entire circumference of the house. It is the middle of winter now, but I can picture in my mind the enchantment of a warm sunny afternoon in the summertime when the great lawn area is bustling with family activity. Children are running around playing games under the protective branches of the sturdy Sugar Pines and Ponderosa trees, others are splashing in the famed Wawona swimming tank, while their mothers watch from the shaded verandas, and their fathers are across the street working on their stroke at Wawona’s own nine-hole golf course. It is a scene straight out of a Norman Rockwell painting. The Wawona may not offer all of the conveniences of a four-star lodge like the Tenaya, things like a private bath in every room, hair dryers, televisions, arcades, etc. But what it lacks in convenience, the Wawona more than compensates for with her unique personality and uncommon flair. Inside the main lodge building our host guides us to the dining room, a bright and cheery room that feels more like an enclosed porch area than a stuffy dining room. Windows surround us on two sides and allow the warm sunshine to pour in and grace us with her warm smile. The chef at the Wawona has prepared us a wonderful Mediterranean dish of Chicken with sautéed vegetables which is absolutely to-die-for. I can’t remember the name of the dish, so I am not even going to try to speculate, but trust me when I say it is fantastic. After we have finished with our main course, our waiter delivers dessert which is equally as mouthwatering…a delectable chocolate cake, the likes of which I have never seen before. A rich fudge-like chocolate cake so moist and delicious, I almost don’t want to chew, because I don’t want the mouth-watering pleasure to end. After lunch, we all take a quick tour of the Wawona’s guest rooms. 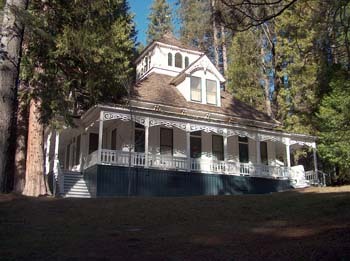 The Wawona is a truly unique lodge from another period in time, offering a variety of rooms distributed throughout six separate buildings. The furnishings at the Wawona are reflective of origin, showcasing beautiful antiques and period pieces that make you feel like you have passed through a wrinkle in time and stepped back into the early twentieth century. I believe there are about fifty rooms at the Wawona which offer private baths, and just a few over fifty which share a bath. Several of the rooms which do not have a private bath will connect to a room with a private bath, creating the perfect set-up for families or groups of friends. One of the things that really surprised me about the Wawona was their nine-hole signature golf course which wraps around the Wawona property adding to the Wawona’s monumental mystique. As far as I know, this is the only golf course in America which is located within the boundaries of a National Park. The fairways are partially covered in snow right now, but I can tell by the looks of them and the surrounding valley that it would be an unforgettable pleasure to golf them during the spring, summer and early fall. The Wawona puts a lot of emphasis on her communal lawn areas and promotes a real spirit of community and family participation especially during her busy season. There are no TV’s, telephones or radios at the Wawona, but what there is, is a real opportunity to step out of the hum-drum of every-day life and enter a simpler world of relaxation, community, and contemplation. 4:30 pm - After finishing our tour of the Wawona, we drive several miles deeper into the park until we reached the valley floor, with one unforgettable stop along the way. If any of you have been to Yosemite Park, you already know what I am referring to…the breathtaking “Tunnel View” lookout point. After caravanning over a winding mountain road secluded in trees on either side for miles, the monotony is suddenly broken as you break beneath the surface of the earth and pass into the Wawona Tunnel. The Wawona Tunnel is remarkably long and glows a bright orange color under the continual glare of hundreds of lamps that line the tunnel ceiling. The moment you break free from the long granite cylinder you are treated to one of the most magnificent panoramas on earth, the beautiful Yosemite Valley from the Tunnel View lookout. This is one of those rare moments in life where the world stands still, if only for a second, and the grandeur of the surrounding environment is burned into your memory for eternity. I pause in the majesty of the incredible scenery that envelopes me and forgets about life for a moment. All of Yosemite Valley’s main attractions are visible from here. To the left of the scene is unambiguous El Capitan sitting like a king on his throne overlooking the entire valley. 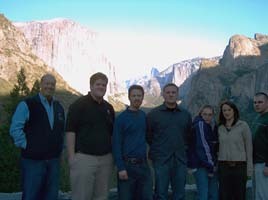 To the right are Bridalveil Falls and Glacier Point providing an impressive symmetry to the standard set by El Capitan. And in the distance at center stage, magnificent Half Dome caps of the scene with her unmistakable profile. Needless to say, our party of six has to capitalize on the moment as we each employ one another to capture the moment on film before proceeding to Yosemite Lodge at The Falls. After basking in the reverie of Yosemite’s glory for a while, we conclude our journey as our caravan pulls into the parking lot at Yosemite Lodge at the Falls. Although it is not quite on the same scale of luxury as the Tenaya or the Ahwahnee, the Yosemite Lodge at the Falls does offer very comfortable rooms, and the views it provides of Yosemite Falls along with its perfect location, only minutes from all of Yosemite Valley’s main attractions, sets Yosemite Lodge at the Falls apart as a must visit lodging destination in its own right. With close to 250 rooms, a food court, several gift shops, a bar/lounge area, an outdoor theatre and an exquisite restaurant offering the utmost in fine dining, Yosemite Lodge at the Falls has all the ingredients you’ll ever need to accommodate an impeccable vacation no matter how long or short your stay. 6:00 pm - After taking a brief tour of Yosemite Lodge at the Falls to see their different room types, I get checked into my own room for the night. My room is a comfortable lodge room with two double beds and incredible views of Yosemite Falls. It feels good to sit down and relax for a while after my busy first day in the park. I can’t relax for long though, our party is scheduled to meet Bridget Rabon, General Manager of Yosemite Lodge at the Falls for drinks in the Mountain Room Lounge, followed by dinner in the Mountain Room (the fine dining restaurant which shares the name). The Mountain Room Lounge is a cozy little bar/lounge enclosed on three sides by glass walls. In the center of the room is a huge open pit fireplace which is blazing bright in the dim light of the lounge. We have a nice meeting with Bridget and then proceed to the Mountain Room for dinner. 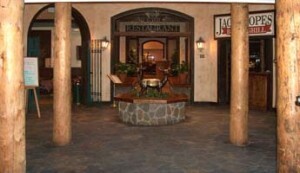 The Mountain Room is a spacious dining room with a rustic mountain lodge ambiance. The walls are decorated with beautiful photos of Yosemite Park featuring many different seasons. I don’t know for sure how many guests the Mountain Room will accommodate but there were ample space and several tables situated about the room. I wasn’t sure what to expect from the Mountain Room, I figured the meal would be good, but… wow…I had no idea it was going to be this good. Our waiter starts us off with an appetizer of the Mountain Rooms signature Crab Cakes…delicious! Following my appetizer, I am served a salad of tossed greens with a very tasty balsamic house dressing. For my main course, I decided on the Filet Mignon. Now I have had very few steak dinners in my lifetime that literally dissolve in my mouth because the meat is so tender and juicy, and I can say without hesitation that this meal rates right at the top of my list of all time most delicious entrees. My cut of meat must have come from a bull that was raised with a lot of TLC and fed only the best food because there was not an ounce of fat, gristle, or imperfection in this steak. Like my chocolate cake at lunchtime, I do not want this incredible meal to end, I try to cut my bites small so that the meal will last as long as possible, but finally, it comes to finish as I raise the last scrumptious bite to my mouth and gobble it down. If you are ever in the Yosemite area around dinner time you must stop in at the Mountain Room and try their Filet Mignon, I guarantee it will be one of the most spectacular steak dinners you will ever eat. Tell them Ryan from National Park Reservations sent you. Following dinner, I cap the meal off with a cup of vanilla ice cream which is a much more generous portion than I had expected, but also very good. 9:00 pm - I am tempted to return to the Mountain Room Lounge after dinner to watch the conclusion of the Florida Gator and Ohio State Bowl Game, which was on TV tonight, but I have some work to do, so instead I return to my lodge room and watch the game from my in-room TV while I work on my laptop for a couple of hours. Today was a full day and I feel privileged to have seen the beautiful accommodations that I have seen and indulging in the scrumptious meals that I have been served. The managers, wait for staff and chefs at the Tenaya, Wawona, and Yosemite Lodge at the Falls have all been amazing hosts, and I would highly recommend their accommodations to anyone visiting the Yosemite area. Oh yes, and once again…do not miss the opportunity to satiate yourself with an unforgettable meal at the Mountain Room at Yosemite Lodge at the Falls. Go with the Filet Mignon…you will not be disappointed. Good night, sweet dreams and I’ll talk with you again tomorrow.